(Newser) – The US government is urging owners of 313,000 older Hondas and Acuras to stop driving them and get them repaired after new tests found that their Takata air bag inflators are extremely dangerous, the AP reports. The National Highway Traffic Safety Administration said Thursday that it has data showing that chances are as high as 50% that the inflators can explode in a crash, injuring people with metal shrapnel. "Folks should not drive these vehicles unless they are going straight to a dealer to have them repaired," Transportation Secretary Anthony Foxx said in a statement. And Florida's Sen. Bill Nelson, a frequent critic of the auto industry, calls the vehicles equipped with Takata air bags "deathtraps." These airbags are dangerous. One poor gal had a low speed impact with another car, barely enough force to dent the front bumper and her airbag deployed, it sent a piece of metal shrapnel into her neck and she bled out before medical aid could be given. Airbags: Yet another theory which, in practice, falls short. Your government enforces use of a technology which may very well kill you, yet the rules stand. I personally witnessed a friend of mine, driving down a village road, suddenly come to a halt, smoke streaming out of her car's interior. She emerged in tears, coughing, blinded, and in a panic. The driver's side airbag in her Buick had deployed -- for no good reason. Worse yet, her young daughter was buckled into her car seat, in the back of the car, and her mother was powerless to get her out. Only when government officials are charged with assault, reckless endangerment, or culpable homicide, will some common sense and accountability be brought to these situations. It's not just Honda's. 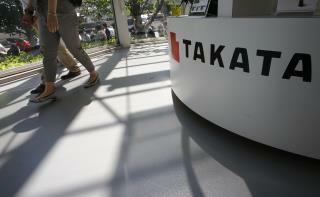 Takata supplied bags to several manufacturers. But the US continues to allow Takata to supply air bags in the US.